Residents of Maplewood are reveling in the delight of the home’s latest occupant, who is really the cat’s meow. 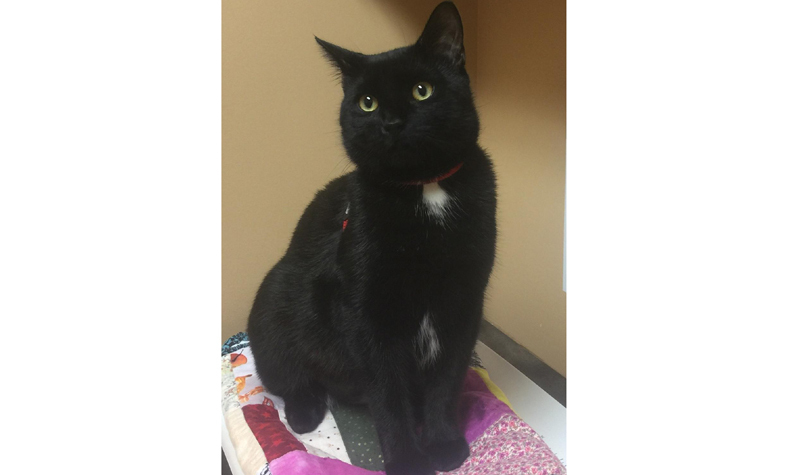 Meet Edgar Allan Pilon, feline companion of Maplewood director of care (DOC) Samantha Pilon. The black cat has made many friends at the Brighton long-term care home since his arrival in August 2017. “The residents love him,” Samantha tells The OMNIway. While dogs are usually associated with pet therapy, Edgar is up to the task of providing comfort. One male resident is extremely anxious. The cat senses his struggle with anxiety and in response cuddles up to the man. “It calms him right down,” the DOC says. The resident also begins to reminisce, noting his mother always kept cats. Edgar occasionally drops by on his own to visit residents but usually accompanies Samantha when she’s making her rounds. The cat is currently on vacation for the summer at the DOC’s home to accommodate a temporary team member who has intense allergies. “He’s totally wound up and stir-crazy,” Samantha says about Edgar staying off-duty. But no matter what name he answers to, he seems to know his purpose at the home. Samantha expects to bring Edgar back to Maplewood in the fall.